Embrace autumn colors and decor before winter takes the stage. Fall into fall 2018 party planning mode before winter arrives. While it has certainly felt (and looked) like winter has arrived, we still have a few weeks technically. When you think of fall, what colors come to mind? Burgundy, rust, orange, gold, chocolate, hunter green, navy, etc. Mostly rich tones, right? What is so wonderful about event planning is that you can make any theme your own – including fall. In the picture above, notice how more muted shades such as peach and seafood were used. Traditionally, you would expect a deeper orange and green. However, they added a touch of ‘dark’ by incorporating black. And we think it looks great. Don’t you? Ask about our party rental selection today. And let’s not forget about the food. Try incorporating some seasonal flavors as well. 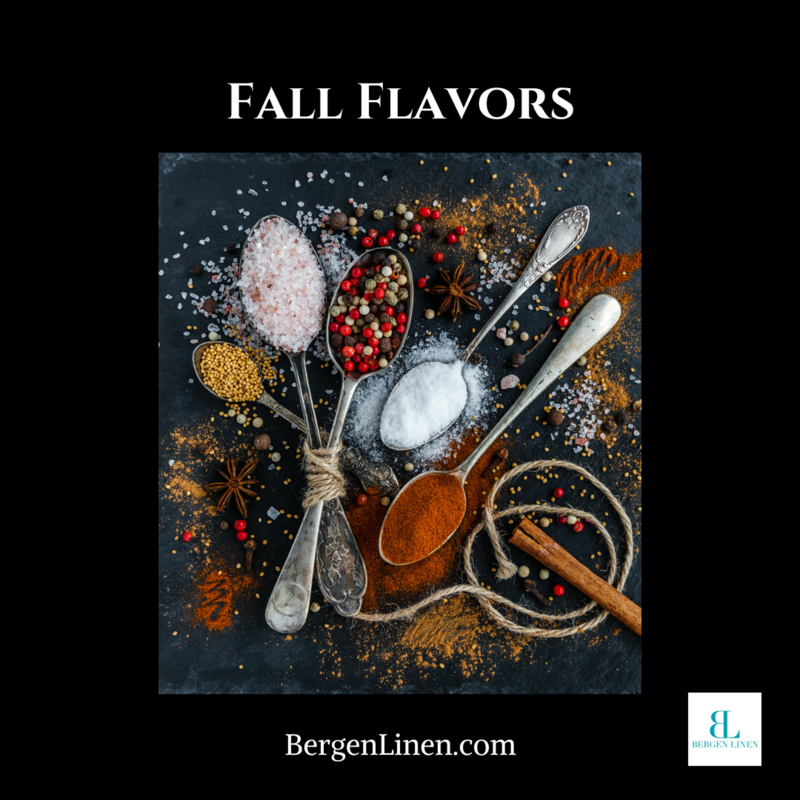 Seasonal flavors are often welcomed. They bring back warm memories of past fall days. Questions about what pairs well? Interested in swatches? We are here to help. For some, party planning is a gift. They can envision an entire event space and know that it will all pull together. For others, it is hard to envision how everything will look together. If you have questions, we often suggesting bringing a few swatches to your party space for a better understanding. 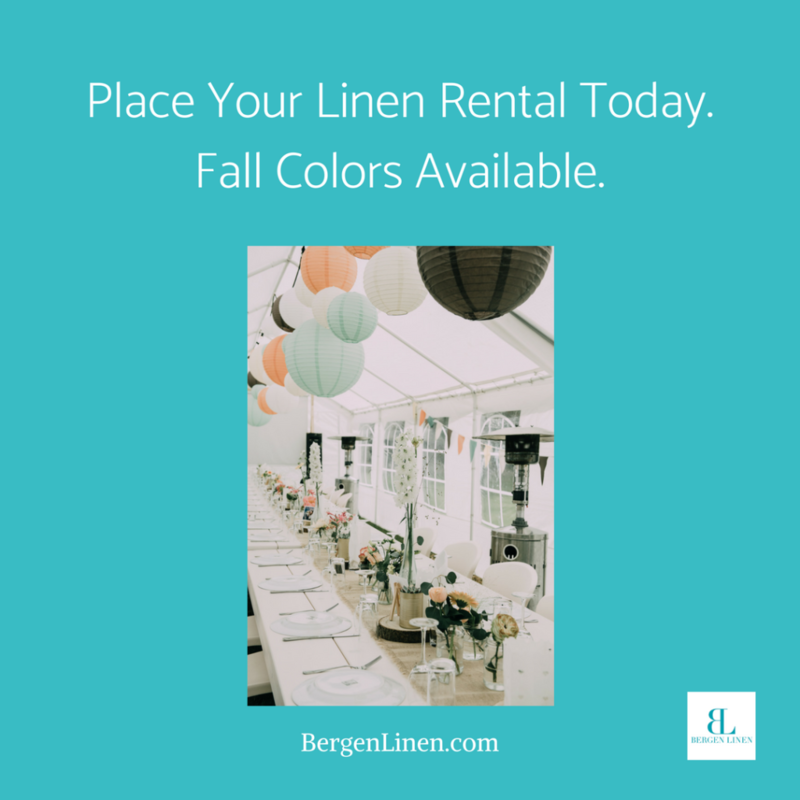 Call (800) 789-8115 and work with one of Bergen Linen’s team members today.